In 1550, a doctor named Alfonso Rodríguez arrived in the city of Valladolid to teach at the University of Valladolid’s Faculty of Medicine. Alfonso had learned medicine in Italy. He was a specialist in anatomy and became one of the best doctors of the time and was known in many places in Europe. Alfonso was a doctor so well known that the course attracted many doctors, graduates, students and apprentices from all over the country and even from abroad. Of all the students of the course, one especially emphasized: Andres de Proaza. Andres was 22 years old and had come to Valladolid from Portugal. Andres seemed to have a natural talent for anatomy and excelled above all his peers. Andres had such extensive knowledge and technique so refined that he even surpassed his master. During the months in which the course was given, they reported the disappearance of a 9-year-old boy. Although that was the most famous disappearance case, other people disappeared mysteriously. No one seemed to associate the young Portuguese student with these disappearances, but the neighbors denounced that from the place where he lived he heard people cry and shout frequently. The neighbors began to suspect him. Some rumors said that Andres de Proaza made deals with the devil. Andres de Proaza lived near the Esgueva River, one of the two rivers that pass through Valladolid. The suspicions of the neighbors were confirmed when they saw that from time to time, the river was stained red by the area where the student lived. Neighbors denounced the case and authorities decided to go and investigate Proaza's house to clarify what was happening. When they entered his house, what they found was terrifying. They found the body of the missing child, he was dismembered. The student had dismembered the child and pinned the different pieces on a wooden board. In addition to the body of the child they found animals, also dismembered, and the remains of other people, although they did not know from whom. The whole house was filled with medical material, blood, human bodies, animal bodies. Some of them were still alive. Evidently they stopped him immediately. He stated that in order to learn medicine he had to practice vivisection. Vivisection is to perform medical operations on the body while the person or animal is still alive to see how the body reacts. The court in charge of judging Andres de Proaza was the tribunal of the Inquisition. During the trial, the people who went to investigate their home explained everything they had seen there and the people were horrified. Everyone thought he was crazy, so they would condemn him to die. However, Andres de Proaza made a statement that scared the people even more. 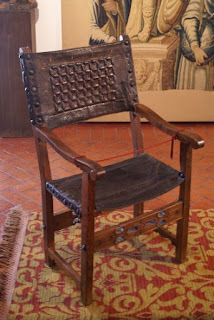 The doctor declared that a necromancer had handed him an armchair, a cursed chair. A necromancer is a magician who practices black magic, that is, magic related to evil. The necromancer gave him the chair because Andres saved his life. According to the necromancer, this armchair had been made by the devil himself. By sitting on the chair, Proaza gained all the advanced medical knowledge he wowed his classmates and professors with. He also told the authorities that only well-qualified doctors could sit in his eternally damned armchair. Anybody else who sat in the chair would die three days later, ditto for anybody stupid enough to destroy it. For his crimes, the Inquisition sent Proaza off to the gallows. An auction was held to sell off Proaza’s belongings, but surprisingly few people were interested in buying furniture associated with child murder and Satanism. For this reason, the chair and everything else Proaza owned were moved to a warehouse at his old university. Years passed, and the story behind the chair was forgotten. In the 19th century, an exhausted beadle stumbled on the chair and slumped down for a rest. True to Proaza’s warning, the beadle was found dead in the chair three days later. The university’s next beadle was no less cautious; he sat in the chair and died as well. After taking the lives of two good beadles, the chair’s thirst for blood had to be stopped. To ensure that it didn’t take any more lives, the chair was hanged upside down from the university chapel. It remained here until 1890, when it was moved to the Museo de Valladolid after the chapel was demolished. At its new home, a red ribbon has been tied across the Devil’s Armchair to keep visitors from sitting in it. This was not done to prevent bright med students from making Faustian pacts, but to protect what’s actually a rare 16th century chair. great post.. i love this blog. Keep posting!